It’s okay to think of the Dodge Charger Hellcat as the Usain Bolt of the car world. Optimised for fast sprints maybe, but in the modern performance car world the Hellcat Charger or Challenger should be able to get itself round a winding track as fast as the rest. This video shows the Dodge Charger Hellcat proving its worth at the Nürburgring in Germany. Its definitely bragging rights to get a good time around the Nürburgring the charger does this quite well in a 8 minutes and 58 seconds time. Quite respectable for a vehicle that wighs 2.5 tons. Bavarian MOPAR Works the makers of the video proving that Germany love their muscle cars just as much as anybody else. It’s maybe why the Ford Mustang GT has sold so well over there, but I digress. There are vehicles that have clearly gone faster round the Nürburgring, but weigh half the amount and cost 10 times more in some cases of a Dodge Charger Hellcat. Lots of fun for the money. 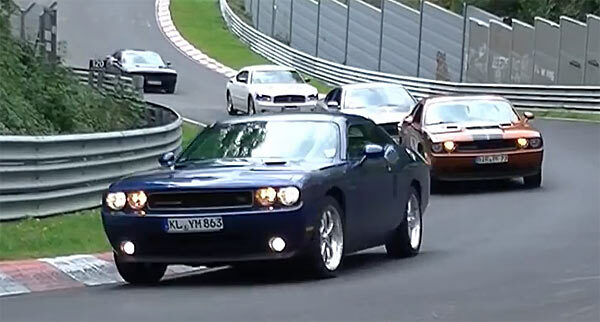 This video below shows a bunch of Dutch challengers and Chargers from the US Cars Club blasting round the Nürburgring on mass.